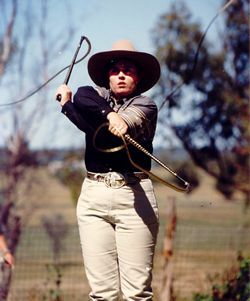 At the age of fifteen Fiona became interested in whipcracking and in doing so entered a competition at Wingham and won the junior NSW Amateur whipcracking championships in 1998 and was runner up in the ladies open competition. Fiona was invited to compete in the Australian championships at the Sydney Royal Easter show. That year Fiona came third. Fiona entered the Australian championships again the following year in 1994. After that Fiona decided she wanted the Australian championships and from then on proceeded to dedicate her towards this goal. Fiona was also approached to start up a club at Glen Inns which is called the Northern NSW whipcrackers and plaiters club. Through doing demonstrations at shows, rodeos and charity events Fiona decided that whipcracking would become a major part of her career. Fiona entered a competition before the Sydney Royal Australian championships and that was at Fladbury, Glen Innes in February 1995 and won the OPEN competition there. 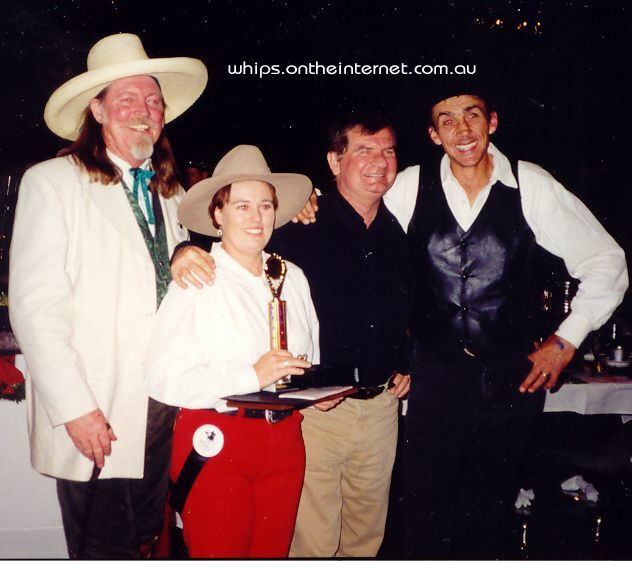 Fiona entered the Australian whipcracking championships and WON, becoming the 1995 Ladies Australian whipcracking champion, then again for 1996,1997 and 1998 becoming the first person, female or male, to win 3 TIMES in a row then 4 times in a row. 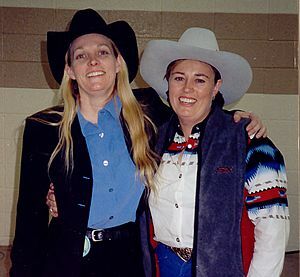 Also in 1998 Fiona saved and went to the USA for an International event held in Las Vegas Navada, the WILD WEST ARTS CLUB (WWAC) where people from all over the world compete for titles in rope spinning, knife throwing, gun spinning and whipcracking and more. Fiona competed against other international countries from the USA, Japan, England, New Zeland, Germany, Sweden, ect. The whipcracking is an open event, and Fiona won competing against men and women. Fiona won the one handed routine, the two handed routine and Fiona also won the John and Vi Brady whipcracker of the year which is a very prestigious title. Fiona Missed the 1999 Australian titles to go back to the WWAC international event held in Las Vegas winning all 3 titles again. Fiona competed in 2000 at the Australian titles winning for the 5th time. Fiona Took time out of competition to perform at shows, rodeos and charity events and with the help of her assistant, her father Jim Wilks, they are now known as THE WHIPAROOS which is a half hour performance or they can vary the time to suite all events. THE WHIPAROOS demonstrations consist of 10 routines as in the competitions, some accuracy work using straws, while Jim holds them in his hands and mouth, a cigarette act where Jim holds a match out in front while Fiona strikes the match with her whip, Jim lights the cigarette then Fiona puts the match out and the cigarette out of Jims mouth with her whip. A disc the size of a twenty cent coin is placed on Jims tongue and Fiona cracks it off, spinning the disc off into the air. THE WHIPAROOS also do whipcracking and rope spinning, juggling and whipcracking, a ribbon act where Jim spins a ribbon around and Fiona cracks it into little pieces. THE WHIPAROOS also include the audience to help in there demonstrations which always gets a laugh. To finish of there performance Fiona does her Bullock whip routine which Fiona has won the open event against men 7 times. While doing demonstrations Fiona saved, and decided to go back to the WWAC for the third time in 2002 winning all 3 sections again and being the first person to win the titles back to back in 1998, 1999 and being the first person to win it 3 times. While there Fiona got to meet and make a lot of friends who are also famous, for instance Jo Benson and Alex Green who is Anthony Hopkins stunt double in the movie Zorro. 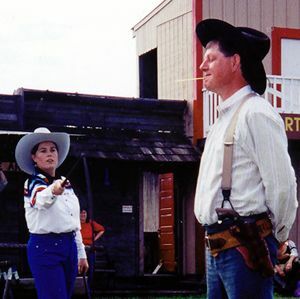 Jo Bowman who is the most respected and one of the best gun handlers, Jo has taught many famous people gun handling and spinning like Sammy Davis jnr, Also the Texas Rangers, the FBI, John Wayne ect. Vince Bruce who performs with horses rope spinning off them and whip work, Vince is the best performer Fiona has seen. Joyce Rice and her daughter, Joyce is the best whip twirler Fiona has ever seen and perform. Fiona has also made many friends from the WWAC and there's too many to mention. 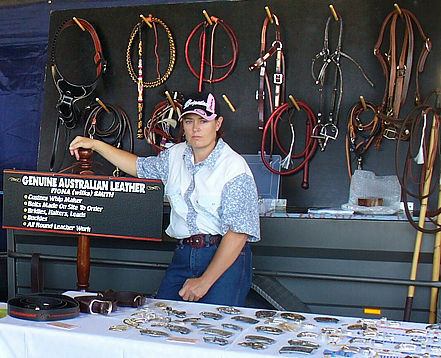 The Australian championships held at Tamworth. Fiona went back in 2005 which she won the Ladies title and has returned again in 2006 & 2007 and since then to win the Australian Ladies title 13 undefeated championships. 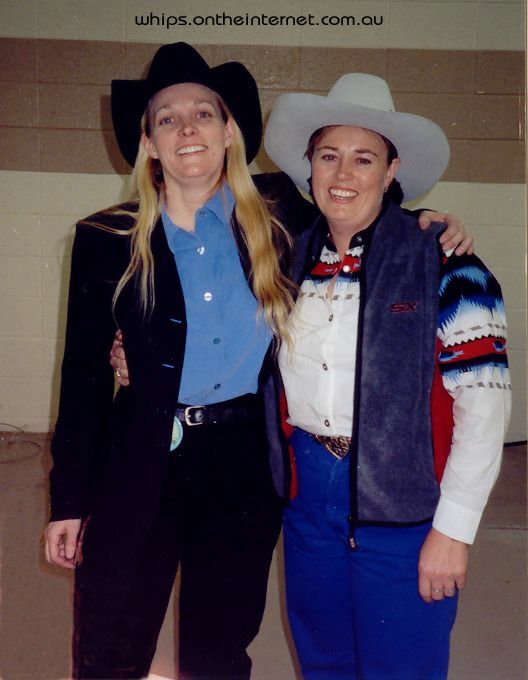 Fiona entered her first AWPA OPEN Bullock whip championships in 2006 and also won this title. 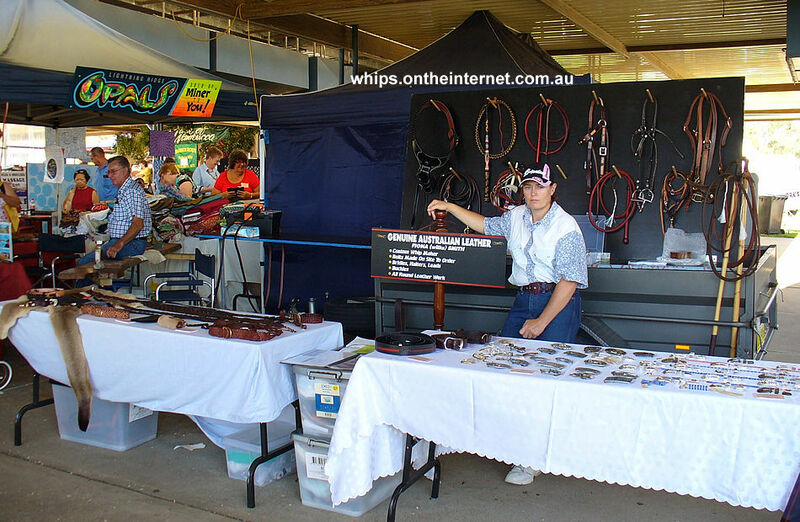 The 2008 Australian Whip cracking championships held at the Royal Canberra Show, where she won her 9th undefeated Ladies Australian title, and also winning her second AWPA Open Bullock whip championships, defeating previous whip champions. 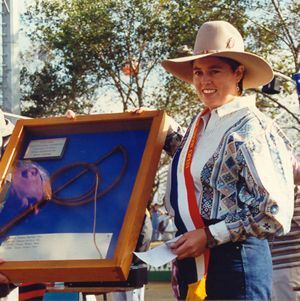 Fiona returned to the Royal Canberrra Show to defend her Ladies Australian whip cracking title, and has now become the first person in the AWAPA to have won 10 Australian titles, and to have also won them undefeated. Fiona's list of achievements can be viewed in her Titles/awards section.